A Church Wedding in Savannah has all the old Southern grace and charm that one would expect from a Georgia celebration. 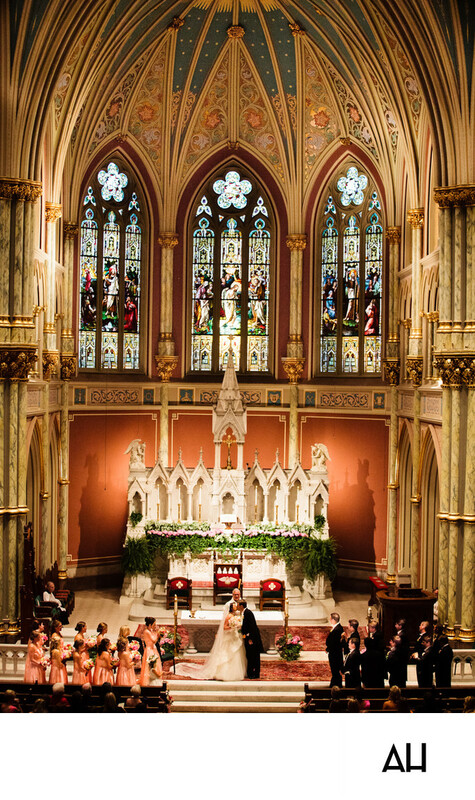 The eye is first drawn to the apse of this Church Wedding in Savannah. The teal and gold domed ceiling reaches up toward the sky, culminating in an image of the sun that shines above the newlyweds who stand below. Also in this domed space, intricate designs in varying hues of gold, brown, red, and blue swirl about the three Gothic style stained-glass windows. The windows glow with the daylight that streams through them, illuminating the biblical images that grace the panes. Each pane documents a moment from the story of the Crucifixion. Below the windows, the tabernacle stands, surrounded by walls painted a deep dusty rose color. The tabernacle is elaborate and grand, with greenery and pink flowers lain about it. At the front of the altar, the priest stands behind the bride and groom as they share their first kiss as husband and wife. The bride is elegant in a flowing, princess-like gown, while the groom looks just as regal in a tailcoat tuxedo. To either side of the couple are their brides in pretty peach dresses and their groomsmen in matching black tailcoats. From afar the image looks like a snapshot of a wedding from a time long ago, when ladies wore dresses to leave the house even for groceries and men always wore suits. It is a classic picture with a timeless feel to it, in a gloriously beautiful Georgia church.